Ex-Wales international Neil Roberts has signed for Welsh Premier League side Rhyl. The former Wrexham captain was released by his home-town club in May after the Dragons were relegated to non-league. Roberts turned down offers from Football League clubs to sign a three-year deal at Belle Vue. "I have spoken to a number of Football League clubs, but decided this is the right move for me and my family," said the 30-year-old striker. 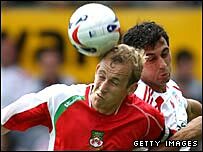 Roberts, who won the last of his four Wales caps against Norway in 2004, opted to join the former Welsh Premier champions as it had the option to begin a coaching career. Is Neil Roberts a good signing for Rhyl? "I'm looking to further my career in the coaching side of things," revealed Roberts. "And going to Rhyl will give me the opportunity to do that as well as continuing to play football. Wrexham-born Roberts is Rhyl's first new signing since Alan Bickerstaffe was installed as manager at Belle Vue and is looking forward to a new challenge. "I feel very positive about the future and the beginning of a new chapter in my life," said Roberts. Rhyl president Peter Parry added: "The signing of such a quality player is just the start of taking the club to the next level." Roberts, though, is ineligible to make his Rhyl debut against Bohmeians in their Intertoto Cup clash on Saturday. Meanwhile, Wrexham captain Richard Hope has signed a two-year deal for League Two side Grimsby Town.